FRIEDRICHSHAFEN, Germany – At the Eurobike Show that closed its doors last Sunday, it was announced that Vuelta Italy not only has a new owner but that Moreno Fioravanti who has been ‘Mr. Vuelta’ for 25 years is leaving the company. That Vuelta Italy was looking for a new owner was brought about by the financial troubles at the construction and real estate company Ethica Spa that took over Vuelta in 2006. The worldwide financial crises which also affected the real estate market in Italy caused the troubles at Ethica that two years ago acquired 60% of the Vuelta shares from Fioravanti for € 2.5 million. Vuelta’s new owner is the financial company SOFIR that acquired 55% of the shares. A new management team for Vuelta Italy from SOFIR has been appointed September 1, 2008. Dr. Di Giacomo is Vuelta’s new President, Dr. Roberto Turchi the new managing director and Stefan Stefanov as export, sales and marketing manager. Vuelta will continue the production of high end wheels in Italy for the Aftermarket. The company will also continue to produce OEM wheels in Bulgaria and China. Vuelta’s China operation is a joint venture with Kunshan Giant Light Metal Co. Ltd. and Vuelta USA and was established last year. Vuelta-branded wheels for the Asian and global bicycle marketplaces are being manufactured in a new Shanghai factory by Vuelta China. A new line of wheels for bicycles as well as for powered two-wheelers carrying the Akront brand name will be introduced at the 2008 EICMA Show that will take place from 4 to 9 November, 2008 in Milan, Italy. 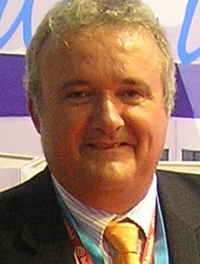 As said Moreno Fioravanti, Vuelta founder as well as President of the European industry association for parts & accessory makers, COLIPED, is leaving the company after 25 years. He is joining Bianchi Bisiklet San.ve. Tic. A.S. in Turkey. This company, that in 2005 took over Atala in Italy, is expanding its activities further. Recently Bianchi Turkey took over another Italian bike maker; Carraro srl Industria Cicli based in Padova. Next to that the Turkish company wants to step in the P&A business under its new brand Byte. Moreno Fioavanti is appointed as managing director of the Byte branded P&A division as well as export sales department coordinator for the Turkish/Italian company.